Convert WAV audio to MP3, WMA, M4A, AAC and 1000+ audio/video formats. Transfer converted WAV/MP3 audio files from PC/Mac to iPhone/Android devices easily. Versatile toolbox combines screen recorder, DVD Burner, GIF maker, fix media metadata, etc. WAV, also known as Waveform Audio File Format, is a widely used audio format developed by Microsoft and IBM for Windows users. However, MP3 format may be a better choice if you want to play your audio files on Mac or on your mobile phones. MP3 format is the most popular audio media file of the internet because of its space-saving techniques and portability. In this situation, the needs for free WAV to MP3 converters raised. You will need to convert WAV to MP3 to ensure that your media files will play on virtually any media player. So, you'll learn the top 15 WAV to MP3 converters free for Windows/Mac, and online in this article. 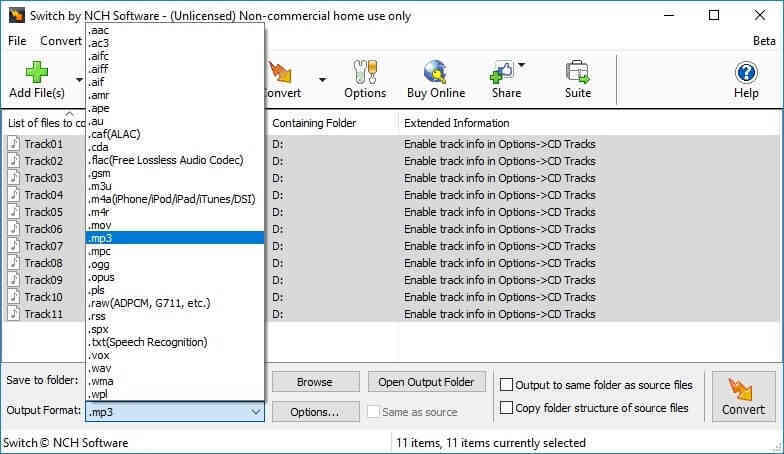 In this part of the article, we are going to go through the top 5 free WAV to MP3 converters available for Windows 10 and below, you can use anyone for your free WAV to MP3 conversion. This is by far the best free WAV to MP3 converter for Windows 10 and Mac system. It supports numerous audio formats including MP3, WAV, M4A, M4B, and others for audio conversion, most common video formats are also available so you can convert audio to video formats too. Wondershare Free Video Converter is easy-to-use and offers very fast media conversion as compared to its competitors. You can download and follow the simple steps below to convert WAV to MP3 free. Step 1: Add WAV Files to Wondershare Free WAV to MP3 Converter. Download, install and launch Wondershare Free WAV to MP3 converter on your PC, you'll come to the Convert tab by default, then click on the +Add Files button on the left-top corner to load your desired WAV files to the program. Step 2: Choose MP3 as Output Format. Hit the Convert all files to: option to open the formats list, and tap on the Audio tab to choose MP3 format and quality. Step 3: Convert WAV to MP3 Free on Windows. When everything is set, click on the Convert All button in the bottom right to start converting WAV to MP3 right away. You can find the converted files from the Converted tab after a few seconds. 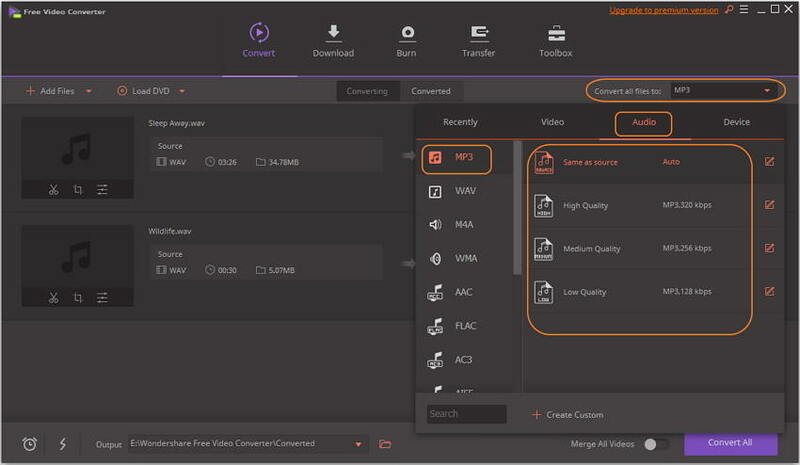 Looking for a more powerful video converter tool? 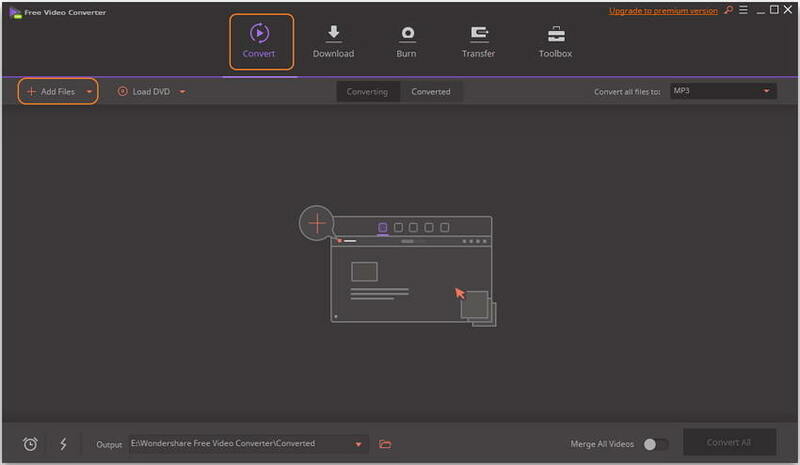 You can try the premium version of Wondershare UniConverter (originally Wondershare Video Converter Ultimate), one-stop solution to convert, download, edit and burn any video/audio formats with just one click. This is a tool developed by iSkysoft and is available for Windows. It is another WAV to MP3 converter free. It supports several audio formats including WAV, WMA, OGG, MP3, AIFF and more. It also includes support for batch convert which is really handy. Allows user to edit bitrate and sample rate to fine tune conversion. Not available for other operating systems other than the Windows OS. Interface not as appealing as competitors like Wondershare video converter. This another tool to convert WAV to MP3 online free. It is fast, powerful and feature rich a free, fast, powerful. It supports, among other formats: MP3, WMA and ASF, M3U, MOV, MP4 and M4A, RM and RA, OGG, AMR, VOC, AU, WAV, AIFF, FLAC, OMA. Delete audio fragment from the audio file. Only available for Windows operating system. Interface not as beautiful as other competitors. Switch is an MP3 converter is free to use for non-commercial use. It offers cool features such as automatic audio levels normalization and access to online music database so as to add song information to MP3. Allows multiple conversion at the same time. Ability to add song information from online database. No free version for commercial purposes. 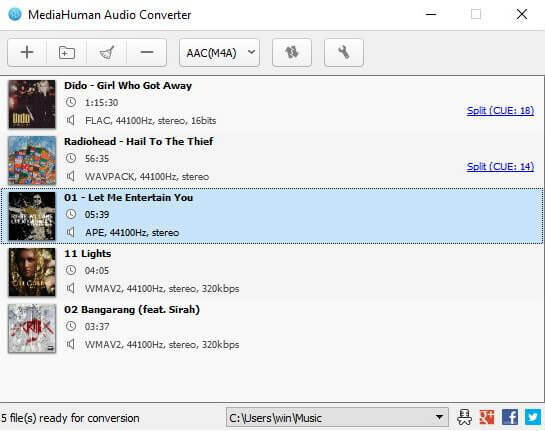 Fre:ac is a free audio converter that comes with support for various popular audio formats and codecs including MP3, MP4, M4A, WMA, OGG, Vorbis, FLAC, AAC, WAV and Bonk. It also converts multiples files in a folder while retaining its folder structure. Add song information from an online music database. Convert music library in a folder and retain its folder structure. Wondershare Free Video Converter for Mac is a free desktop media converter available for both Mac and Windows system. It boasts support for numerous media file formats both video and audio while still maintaining an easy to use UI. It functions almost the same as the Windows version (mentioned in Part 1). A watermark on the converted video like all tools. All2MP3 is a utility tool that allows Mac OS users to ability to convert WAV to MP3 freeware. 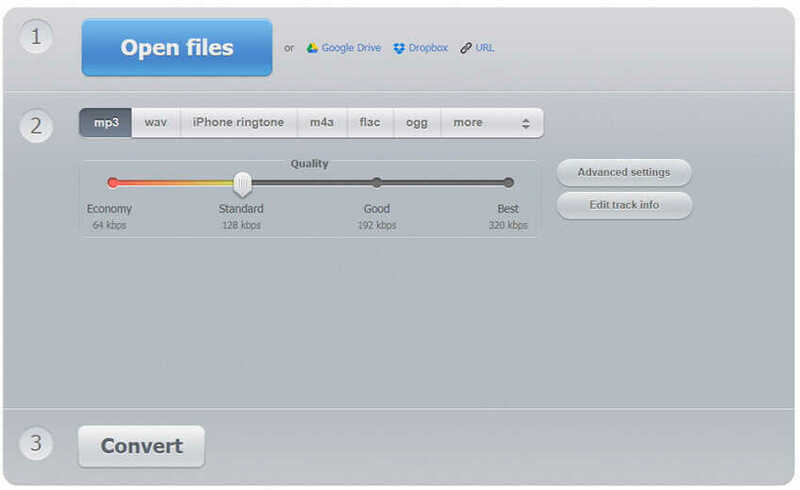 It offers the option to adjust the bitrate easily and works really fast. Supports just about any audio file to convert into MP3. Work only on Mac, so Windows users can't use it. This is a free desktop software available for Mac OS X and Windows. It has the ability to convert multiple media files and can export directly to iTunes. Allow direct export to iTunes. Support batch converting while keeping the folder structure. Slower speed as compared to Wondershare UniConverter (originally Wondershare Video Converter Ultimate). FFmpegX is a really fast and flexible video audio encoder for Mac OS X users. It has support for basically any audio format. Useful for advanced users who need to customize advanced settings. Only available for MacOS X users. 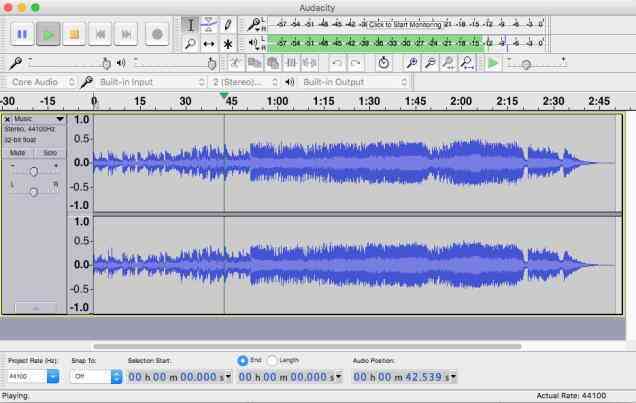 Audacity is a free and open-source audio management WAV to MP3 converter that has the ability to edit and convert between different audio formats with the help of external libraries. It is available in all the major operating systems i.e. Windows, Mac OS X and Linux. It is the best WAV to MP3 freeware that is available to all major operating systems i.e. Windows, Mac OS and Linux. Work for virtually all audio codecs with the help of external libraries. Its open-source hence anyone can contribute to its development. You can also understand what goes on behind the scenes. Some conversions don't work out of the box e.g. conversion to MP3. The internet has grown a lot in the last decade and so have online websites including utility tools. One of the tools that have become so capable lately are online converters including audio converters. Here are 5 of the best online WAV to MP3 converter free. 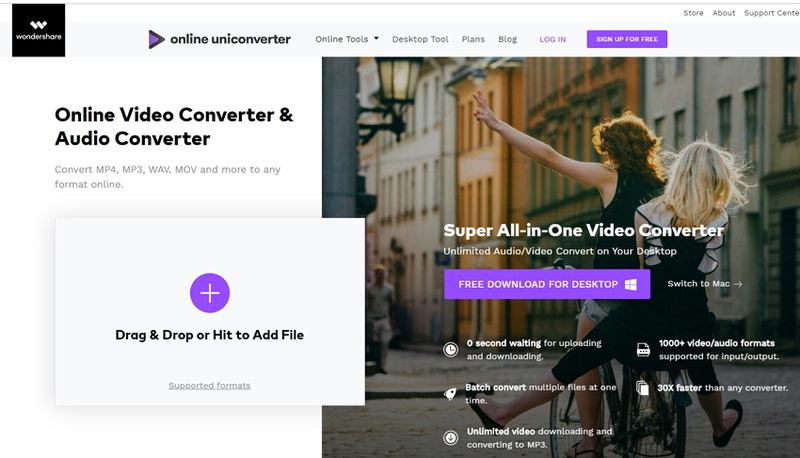 Online UniConverter (originally Media.io) is Wondershare's online media converter that can double up as a WAV to MP3 converter free download. Head over to media.io and click + Add your files to add the WAV file. Click the drop-down arrow next to Convert to: and choose MP3 under Audio. Hit Convert to start WAV to MP3 online conversion. 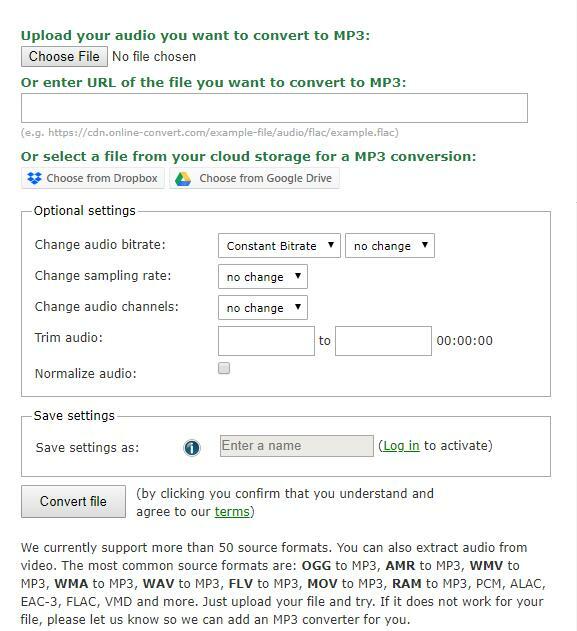 When the WAV to MP3 conversion completes, you will be able to download the converted .mp3 files to your device. Very easy and straightforward to convert WAV to MP3. Cannot convert file that is in Cloud. Limited audio formats as compared to desktop software. Comes with support for conversion of files in the cloud. Provides the user with the ability to edit metadata in the audio file. The number of audio formats that are supported are limited. Online convert group of file converters that offers a free online WAV to MP3 converter. 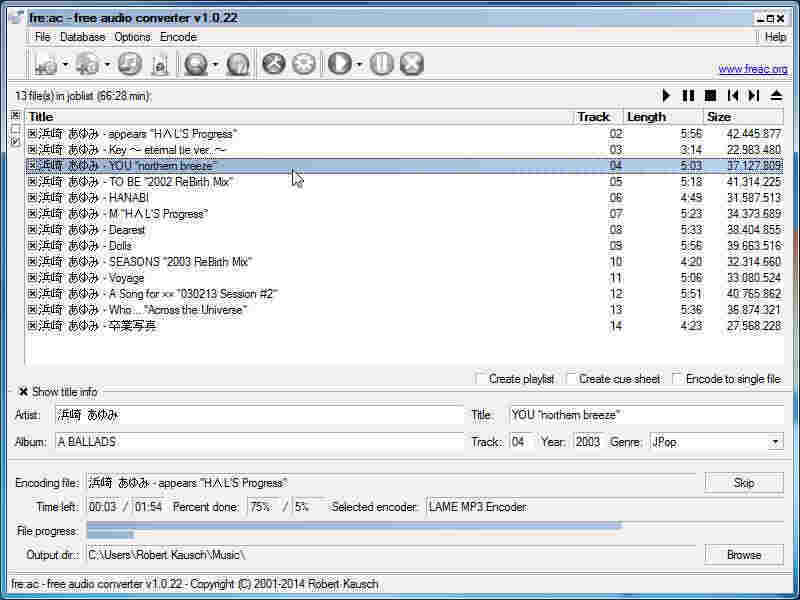 The audio converter section allows the user to convert media files fast, for free and without installing any software. Support uploading file from google drive or Dropbox. Has the ability to change bitrate, sampling rate and audio levels. Ability to trim audio file to specific section using time. Don't support nearly all of the audio formats despite supporting over 50 of them. Convert files is a free WAV to MP3 online utility tool that enables users to convert files between different formats. 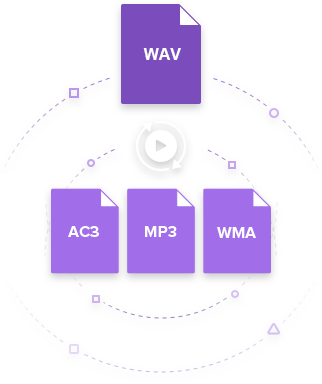 Its audio tools can be used to convert between WAV and MP3 in simple steps. Easy to use in just simple steps. Enjoy faster conversion speeds as compared to others. Only supports file URL and direct upload. This is a website that offer ability to convert media both audio and video. The files formats supported are MP3, AAC, OGG, WMA, M4A, FLAC, WAV, MP4, AVI, MPG, MOV, WMV, MKV, M4V, WEBM, FLV and 3GP. Don't provide support to use others sources of media files other than those in the device. We have gone through 15 of the best WAV to MP3 converters for Windows, Mac and online each with different pros and cons. Your choice will depend on features you need and the operating system you are working from. For Windows and Mac users, Wondershare Free Video Converter is the most recommended free WAV to MP3 converter.